Xenarthra (indicated in magenta): a group once included in the order Edentata (anteaters, armadillos and sloths). Euarchontoglires (indicated in blue): a group that includes the Primates and the Glires (Rabbits + Rodents) as sister taxa. Laurasiatheria (indicated in green): includes the Ungulate orders Perissodactyla and Artiodactyla, and the Carnivores, Pangolins, Bats and Insectivores. Phylogeny pages for the Carnivores, the Primates and for the three ungulate groups can be reached from links on this page. Linked group names are boxed. Links to pages for other mammalian groups represented at the zoo (e.g. bats) are also provided. William J. Murphy, et al. 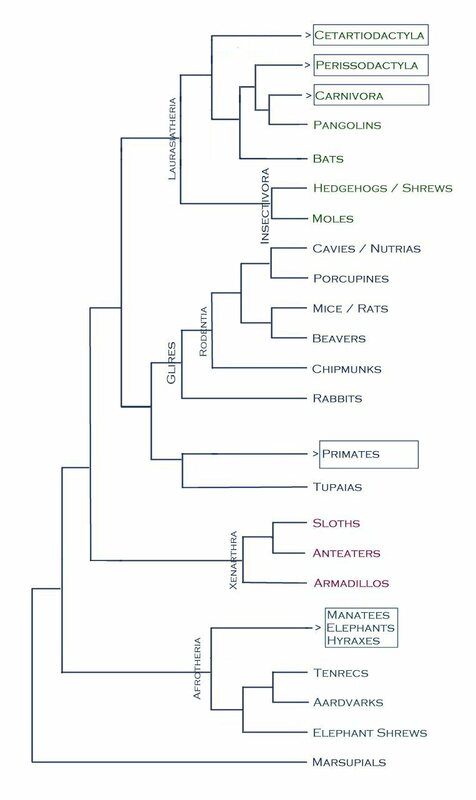 Molecular phylogenetics and the origins of placental mammals. Nature 409 (1 February 2001): 614-618. Ulfur Arnason, et al. Mammalian mitogenomic relationships and the root of the eutherian tree. Proceedings of the National Academy of Science 99 (11 June 2002): 8151-8156. Hidenori Nishihara et al. 2006. Pegasoferae, an unexpected mammalian clade revealed by tracking ancient retroposon insertions. PNAS 103 ( 27 June 2006): 9929-9934.